If you cook Indian food often, then chances are you’re already familiar with using a pressure cooker. If you haven’t switched from a stovetop pressure cooker to an electric pressure cooker like an Instant Pot yet, then you are missing out – big time. The electric pressure cooker is a godsend, especially when it comes to Indian cooking. 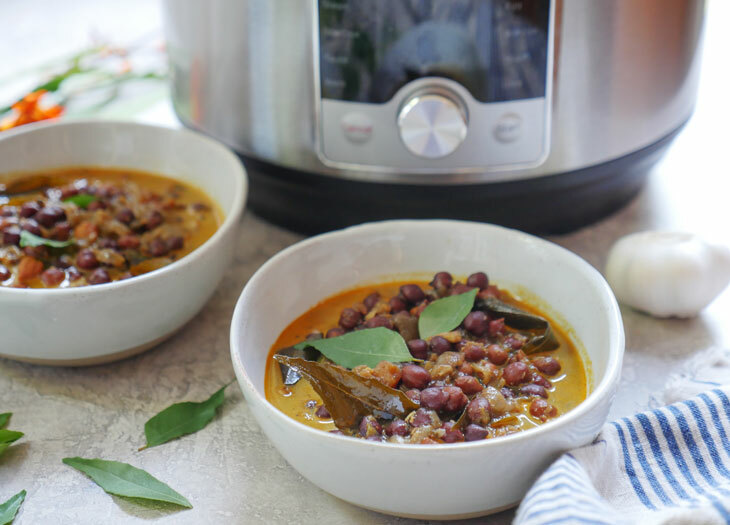 It used to take me hours to cook authentic Indian food, but now I can create almost any Indian dish in my Instant Pot in less time and with less effort. In my cookbook, Indian Food Under Pressure, I wrote a section about why I love cooking Indian food with my electric pressure cooker. I figured I’d share that section here for all of you. If you’ve been wondering whether you need an Instant Pot or another electric pressure cooker then hopefully this blog post will help answer that question for you. I get asked often about which Instant Pot model I use – I have two different models but the Ultra is easily my favorite. If you’re interested in Indian Instant Pot recipes, you can join this Indian Instant Pot Facebook group with 32,000+ members! 107k members (update 9/17/18)!! I have been using an electric pressure cooker for several years now, but it wasn’t until I became a mother that this appliance became my go-to cooking device. I have been able to adapt so many Indian recipes to be one-pot friendly, making the recipes much more approachable. I use my pressure cooker daily, sometimes multiple times a day, and when it comes to Indian cooking this is pretty much the only appliance I use these days. When you cook your meal on the stovetop, be it in a regular pot or a traditional pressure cooker, you need to heat it over a burner and watch it closely. However, with an electric pressure cooker, you just plug it in, press a button and let it do the rest. I’ll be honest, by “aroma,” I mean “smell.” I love Indian food, but those of us who cook it often know that the scent of ginger, garlic, onion and spices can seep into everything around the kitchen. While I don’t mind the smell of onion and garlic, I don’t necessarily want my clothes, jackets and everything on the first floor to smell. In my opinion, the pressure cooker does a much better job at containing that smell. I’ve also noticed that the pressure cooker makes food more flavorful; spices seem to infuse better than they do when I’m cooking on the stovetop. I love how easy it is to clean an electric pressure cooker! I just put my steel insert into the dishwasher, which is something I can’t do with most of my pots and pans. That said, I do suggest keeping two silicone rings on hand: one for savory recipes and one for sweet recipes. No matter how hard you try to keep your silicone ring clean, the fact is that it will absorb strong flavors. Using an electric pressure cooker provides consistent results because there’s less room for human error. I get distracted easily, especially while caring for my baby. When I’m cooking on the stovetop, I have to keep track of time, whereas with an electric pressure cooker that isn’t an issue. Heat evenly distributes and cooks the food perfectly. Each time I make a dish, I can expect it to turn out the same. The reason this comes with an asterisk is because the truth is, it’s not always faster to cook food in a pressure cooker, especially when it comes to quick cooking meats and vegetables. That’s one reason I chose not to include seafood recipes in my cookbook – that said, I do now have a couple seafood recipes on the blog. This appliance takes time to build pressure before the cook time begins and it also takes time to naturally release pressure once the cook time is over. When it comes to cooking legumes or other meat, especially red meat, it is certainly faster to use an electric pressure cooker than to use a regular pot over the stove. You might be wondering if a stovetop pressure cooker is a faster option? While a stovetop pressure cooker is technically slightly faster in terms of cook time, I think that once you take into account the amount of time and effort spent watching over it, counting whistles and hand washing the parts, that it’s actually easier and faster to cook food in an electric pressure cooker. Grab an Instant Pot + check out my Instant Pot recipes on the blog and get cooking! Great blog. Do you know where I could purchase an Instant Pot. Amazon doesn’t have it. I live in Australia. I got a quick question while visiting your site. I know you have a kid. My son is 2.5 and im curious to know what kind of special food that we can prepare for toddlers? Im feeding him all we eat not just the american food… but really curious to know what i can prepare with IP for him when i have a lazy/busy day instantly. I know Mac and cheese is one. anything else that you could share with me? Hi Saidha! I’m so glad you liked the butter chicken! 🙂 I pretty much feed my son whatever we are eating – he loves most meat curries and dals – especially my butter chickpeas recipe. If you make pasta, try the lentil pastas from trader joes! Tony loves the black bean pasta and red lentil pasta. You can also make things like pancakes and freeze them. Sandwiches are also an easy thing to make on a busy day. I hope those ideas help! Thanks for your reply Ashley, yesterday i made pasta with IP. It is a veggie pasta box and i added peas and beans on top of it. My hubby and I liked it and my son doesnt and ate only 1/4 of the bowl. Not sure why. But felt bad as that was the only item i made for dinner last night. Let me see what variations i can do to make him like the same..
Pressure Cookers can also be used to Preserve Food. The big thing that stops me from cooking Indian is the smells – the oil, cumin, coriander, ginger, garlic combo always seems to travel upwards to my bedroom closet and seep into my clothes. Does the IP contain the smells very well or do you still find the smell in your clothes?